Reggae, rum and relaxation: three words that encompass just a few of the great things the beautiful Caribbean island of Jamaica has to offer. Come and join us on our All-Inclusive beachfront hotel located in stunning Montego Bay. We can while away our days enjoying the stunning beach with a cooling cocktail. Dance to the reggae beat! Travellers have been captivated by Jamaica for hundreds of years, ever since Christopher Columbus first stepped onto the island. Apart from its bright sunshine, white sand beaches and warm smiles, visitors will also love its natural beauty. Miles of lush cane fields, rivers, waterfalls and not forgetting the Blue Mountain and its world famous coffee. 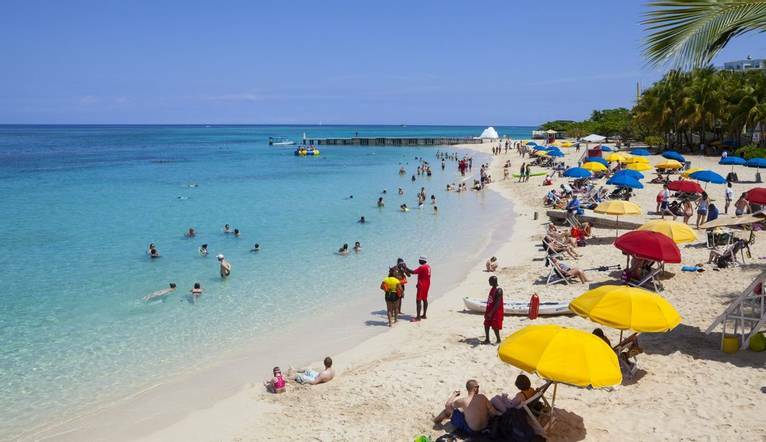 Majestic sandy beaches, reggae music, jerk chicken and spiced rum - Jamaica offers visitors all the typical Caribbean stereotypes. Our hotel is in the second largest city in Jamaica – Montego Bay. Located on the north-west coast of the island, this vibrant city is jam packed with Caribbean charm, and is buzzing with life day and night. Just a few steps from our hotel is the picture perfect beach with clear turquoise water. A range of water sport activities are available to partake in for an additional cost. The most important decision we will have to make each day will be if we wish to spend the day on the beach or relaxing by the swimming pool! Just 20 minutes’ drive from our hotel will take us to Gloucester Avenue, or ‘Hip Strip’ as it is affectionately known by the locals. Here we will find 3km of shops, themed bars, restaurants and street vendors selling the all essential souvenirs to take back home. For some authentic and (arguably) the best jerk chicken in all of Jamaica, the place to head to is Scotchies. Cooked in an open pit over pimento tree wood, this famous street food really is one to try for yourself. Tempting as it is to stay and laze by the pool (or beach), why not get out and about discover the famous landmarks of Jamaica. No visit to Jamaica is complete without seeing the dramatic Dunn’s River Falls. The natural waters will refresh you so much, you will want to climb the 600ft waterfall and bask in its refreshing natural pools. Think of Jamaica and Bob Marley comes to mind. Why not visit the birth place of the father of reggae music at Nine Mile, with a tour through the very same house that Bob lived in as a young boy. *Any excursions bookable in resort are subject to availability. There is a classic Jamaican feel here; with the fabulous stretch of sandy beach on our doorstep, and surrounded by thick greenery our beachfront All Inclusive hotel is the perfect choice to experience an unforgettable holiday. Rooms inlcude air-conditioning, hairdryer, safe, satellite TV, minibar, tea/coffee making facilities, iron & ironing board, complimentary Wi-Fi and balcony or terrace. The transfer time between Sangster Airport and the Iberostar Rose Hall Beach is approximately 20 - 25 minutes. There are several optional tours, which may be on offer during your stay. Full details of these tours will be given at your Information Meeting. Your Tour Leader will help arrange these for you but may not necessarily accompany you. Experience some of the wonderful highlights of Montego Bay’s architecture on The Montego Bay Highlight tour. Stops will include Hip Strip, Doctor's Cave Beach Club, Margaritaville Caribbean Bar and Grill and more! Drive through the hills of Nine Miles, to the birth place of Bob Marley - while listening to the cultural music from the 70's to present. Visit this little village Bob Marley where Bob spent his childhood and very often came back for inspiration and to write his songs. Experience the friendly vibes of the community that influenced Bob Marley. The highlight of the tour is of course walking through the beautiful mausoleum, Bob's final resting place. We then drive to Dunn's River Falls in Ocho Rios. Dunn's River Falls is one of Jamaica's national treasures. Globally, it is as well-known as reggae and equally stimulating. Hampden estate is one of the oldest sugar estates in Jamaica. Renowned throughout Jamaica’s rum history for its full, intensely flavourful pot still rums, it continues today to be the quintessential heavy pot rum of choice throughout Europe and other parts of the world. Among the oldest and most revered estates in Jamaica, Hampden dates all the way back to 1753. Sugar was king then, but today the Estate chiefly builds upon its strong rum heritage, producing the world’s most eagerly sought after heavy pot still rums. Learn about the 260 year-old rum making process still in use today and taste the award winning Rum Fire and Hampden Gold rums. Explore the picturesque grounds surrounding the Hampden Great House while getting lost in the history of this magnificent estate. We suggest a group collection at the end of your holiday to cover drivers, guides, porters and hotel staff (including restaurant, kitchen and reception staff) of approximately £20.00 per week, (or the equivalent amount in local currency). Your Tour Leader will collect this on your behalf and distribute it accordingly, thus relieving you of the burden of who, when and how much to tip. The tipping of bar staff and housekeeping will be left to your individual discretion (the rounding up of the drinks bill and a small amount left in your room on departure should cover this and would be much appreciated). As is customary, ‘the hat’ will be passed around for the driver and guide on all optional excursions. For any meals that are not included in your itinerary, restaurants expect a 10Ͽratuity (do check that service has not already been added to your bill). For taxis 10Ͽf the metered fare. Swimwear is considered suitable for the beach and poolside only, so a robe/cover-up would be useful. Comfortable shoes are a “must” for sightseeing. The hotel prefers reasonably smart dress for dinner – gentlemen are asked to wear long trousers and a formal shirt.